You may receive updates from AdMo4Rd, the sponsor of this petition. 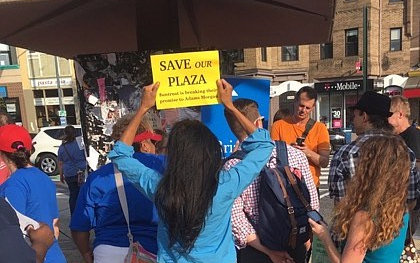 Save Our Plaza, Mayor Bowser! Monty Hoffman wants to turn our historic Adams Morgan public plaza into cash for himself. Instead, we ask that the pedestrian intersection at 18th Street and Columbia Road, NW be improved, yet remain a central community gathering space and plaza serving the residents of Adams Morgan. We are members of Adams Morgan for Reasonable Development, a local community group opposed to the current Hoffman plan to build a 80+ foot tall Bethesda-like apartment complex that would subsume the public plaza we enjoy now. We have been joined in this opposition to this project by our ANC, the Kalorama Citizens Association, and our Ward One Council Woman. We support City intervention that will protect our plaza from encroachment by any proposed project at this central site in our neighborhood. We support the City in efforts to purchase this property so that we the residents can preserve the history and shape the future of development at this special location. We are pursuing plans to preserve our plaza as an improved open public space that can positively effect all future generations who come to live, work, and play in our neighborhood, and we need the City's help. We want progressive and serious engagement by our elected officials, especially our Mayor, regarding this critical planning issue that could forever change the character of our historic neighborhood. Monty Hoffman wants to turn our Adams Morgan public plaza into cash for himself. Instead, we ask that the pedestrian intersection at 18th Street and Columbia Road, NW be improved, yet remain a central community gathering space and plaza serving the residents of Adams Morgan. We are members of Adams Morgan for Reasonable Development, a local community group opposed to the current Hoffman plan to build a 80+ foot tall Bethesda-like apartment complex that would subsume the public plaza we use and enjoy now. We have been joined in this opposition by our ANC, the Kalorama Citizens Association, and our Ward One Councilwoman. We support city intervention that will protect our plaza from encroachment by any proposed project at this central site in our neighborhood. We support the City in purchasing this property so that we the residents can shape future development at this special location. We are pursuing plans to preserve our plaza as an improved open public space that can positively effect all future generations who come to live, work, and play in our neighborhood, and we need the City's help.